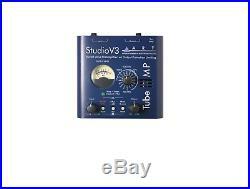 ART TUBE MP STUDIO V3 MIC PREAMP WITH VARIABLE VALVE VOICING INTERFACE. TUBE MIC PREAMP WITH VARIABLE VALVE VOICING. The Tube MP Studio V3 delivers warmth and fatness to any audio source while maintaining an exceptionally low-noise signal path. While its primary function is as a microphone preamp with +48V phantom power, variable gain and phase reverse switching, the Tube MP is also an exceptionally versatile tube driven direct box for any instrument source. The Tube MP Studio V3 uses ART's proven V3 (Variable Valve Voicing) Technology to instantly contour the tone to any source. V3 presets were created and fine-tuned by some of the industry's top studio and live-sound engineers and allow instant access to a multitude of preamp settings designed for guitars (electric and acoustic), keyboards, bass guitars, drums, vocals and more. Additionally, the Tube MP Studio V3 employs OPL (Output Protection Limiting) technology to protect the next component in your signal path from clipping and overloads. The Tube MP Studio V3 offers exceptional sound quality and superior performance to that typically found in "on-board" preamps found in today's low-cost mixers, multi-track recorders and audio cards making it an ideal tone-shaping tool for any application. The item "ART TUBE MP STUDIO V3 MIC/MICROPHONE PREAMP WITH VARIABLE VALVE VOICING AMPLFIER" is in sale since Sunday, July 23, 2017. This item is in the category "Musical Instruments\Pro Audio\Preamps & Channel Strips". The seller is "re_act" and is located in Gosford, NSW. This item can be shipped worldwide.